For You have extensive experience in the installation of Velux windows. Velux roof windows can transform an otherwise dark space into a light filled room whilst also providing perfect ventilation. We Fit For You works throughout the North maintaining Velux windows for clients in both the domestic and commercial sectors. With time served fitters and a wealth of experience it is wise to choose the right company and avoid the rouge traders. As time served skylight installers, We Fit For You ensures your repair or installation will run smoothly. There are various options for the Velux roof windows including, centre pivot roof windows or top hung roof windows. We can happily talk you through the best solutions for your living space. We also include roof terrace and balcony systems ensuring you have all the best available options open to you. 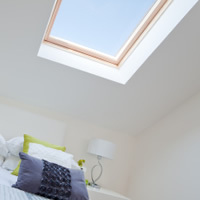 As well as the standard Velux window, We Fit also offers a flat roof option. This is the perfect solution for companies with flat roofs to open up their working space and provide potential office accommodation with daylight. The latest flat roof windows come with a built-in rain sensor that automatically shuts your window when it rains and are energy efficient also. The is also the option of a flat roof kerb window. This angles slightly differently from the flat roof window, but still offers the same benefits. Remote control access is optional on both variations. The ideal compliment with your newly installed or repaired Velux window is a Velux blind. We Fit For You can both order and install your blind to ensure you have the prefect finish. The blinds come in various design and help control the amount of light you let into your room. Your blind may also be in a slightly awkward position, that is why Velux offer a remote control functionality should you require it. All Velux blinds come with a standard 3 year guarantee. We Fit For You are part of the Velux Installer Partnership. With our 5 star rating, this ensures we are regulated to repair and install Velux products from Velux themselves, giving you have total piece of mind. If our standards do not reach yours, you can contact Velux directly to resolve any issues you may have. However we would like to add this has not happened to date and we guarantee you will have total job satisfaction on all the services provided by We Fit For You. Click here to view the Velux Installer Partnership.